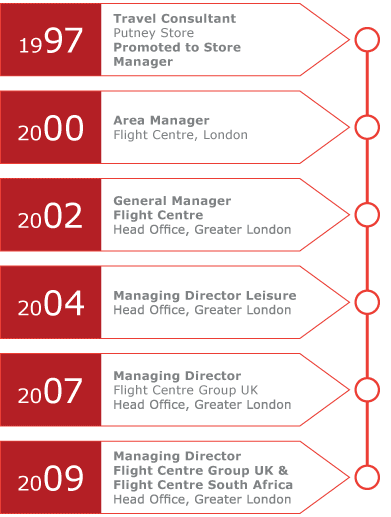 Flight Centre Limited takes your career development seriously. Our unique organisational structure ensures you gain support from your Team Leader and Area Leader and access to our Leadership Training Programs. You will also be encouraged to explore career opportunities across all of our brands and departments, so if you want to move from the leisure arena to corporate travel, we can help you do just that. Furthermore, if you want to take on a new challenge in our Head Office – from marketing to IT – we’ll help you gain the training and experience you need to achieve your career goals. 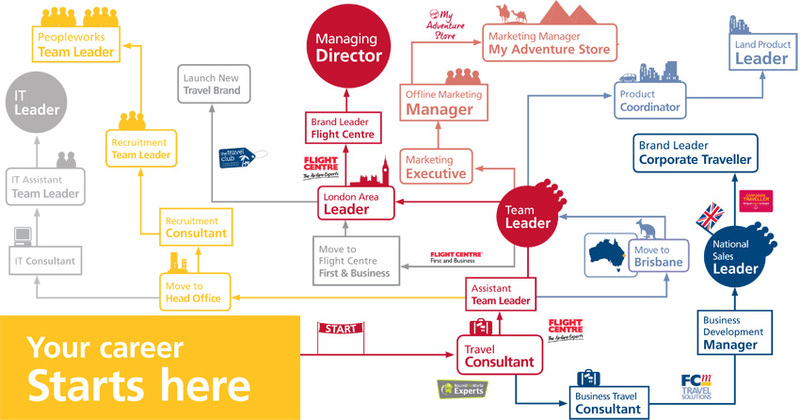 Here are some examples of the career paths chosen by Flight Centre Limited’s Leaders. From a Travel Consultant in our Putney store, Chris worked his way up to become Managing Director of Flight Centre Group UK and South Africa. Being part of the business from the early days has meant I have experienced everything from being a consultant through to Managing Director. I’m proud to have had a hand in growing Flight Centre Limited to the size it is now. Also, working with people who love travel as much as I do is an added bonus. 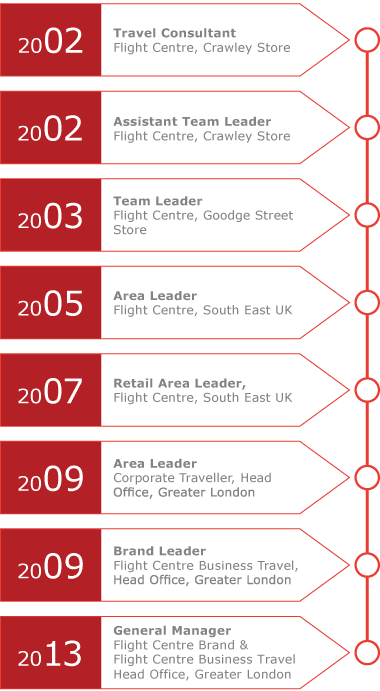 Over eleven years, Ali has progressed from a Travel Consultant in Crawley to a Team Leader, Area Leader, Brand Leader and currently the General Manager of Flight Centre and Flight Centre Business Travel. 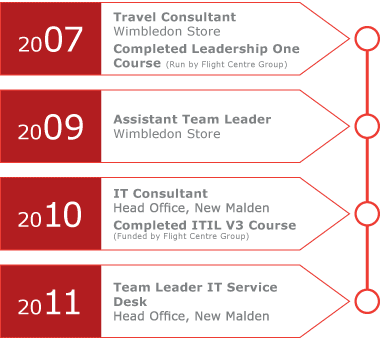 The best thing about Flight Centre is the opportunities – they are simply fantastic, if you want it then just go for it. Also, qualifying for the Global Conference is incredible, every year they get bigger and better and once you’ve been once, you never want to miss it. Sue’s career has spanned three countries, including Australia, Canada and the UK. She currently works in London as the Marketing Manager of our Corporate Brands. 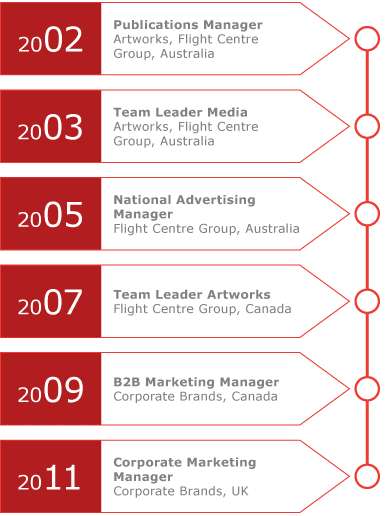 Having the Flight Centre experience in different countries across multiple brands has been a huge opportunity, particularly as each business has been at a different stage in their Flight Centre Limited timeline in terms of growth, development and success. I’ve made it to three Global Gatherings, once with an on-stage award, which is a definite high. However, seeing people you’ve recruited go on to kick it and succeed has to be one of the most satisfying parts of being a Flightie. Chris began as a Travel Consultant before gaining the training he needed to join the company’s IT department. He now leads the IT Service Desk. I was already working as a Travel Consultant but I had always been interested in IT. I’d heard that Flight Centre encouraged people to move around within the company, take on management positions and essentially develop their career, so I thought I’d give it a go. 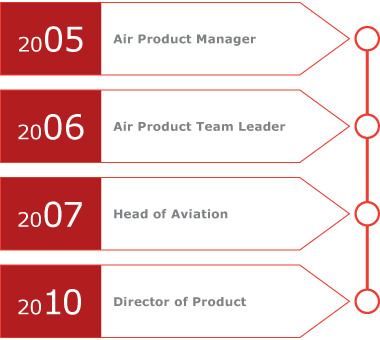 Mick has worked within Flight Centre’s product department for eight years, rapidly progressing along his leadership pathway before achieving a senior management position as Director of Product. I’d wanted to work with airlines from a very young age and moved from Australia to the city with the most airlines in the world - London. One of the benefits of working within Flight Centre is the huge diversity in products and suppliers. Once you begin a career with us, you will be free to explore opportunities in a number of different areas of the business. To view our current vacancies and begin your career path, simply click on the image below.